Panaeng is a lovely mild curry named after tropical Penang, which used to be a part of Thailand. Add the Thai Gold Coconut Milk to a saucepan and heat up to near boiling, stirring frequently. Add 2 tsp of Thai Gold Panaeng Curry Paste and stir, combining the paste with the milk. Add the Kaffir Lime Leaves, sliced pork steak and chicken stock. Add 2 tsp of Thai Gold Nam Plaa (Fish Sauce), and the Palm Sugar. Cook for 15 minutes. Finally toss in the sliced vegetables, chillies and cook for a further 2-3 minutes. Tip: Hot & Spicy: Add chopped chillies to increase hotness, birds eye are the best. 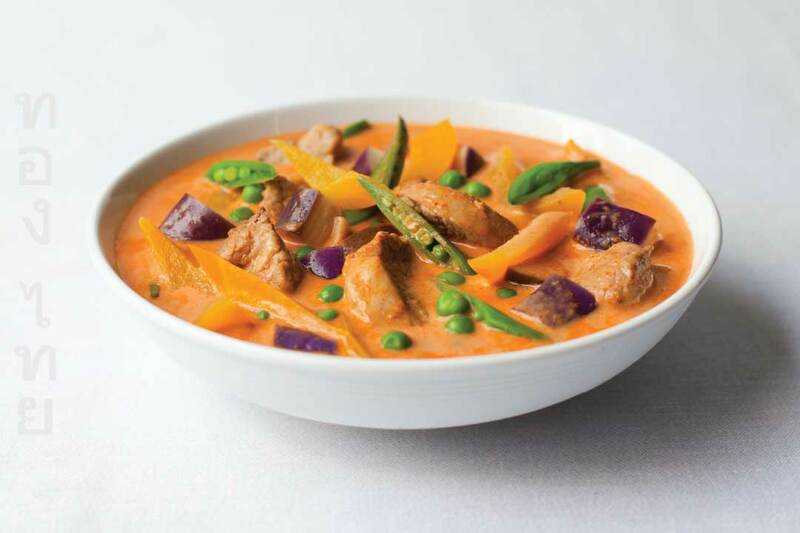 Variation: Try stir-frying a panaeng curry. Serve with Thai Gold Jasmine Rice.